Setting accounting exports add-on preferences is fairly easy if you have basic knowledge of accounting. Moreover, most of the default settings can usually be kept. The first part allows you to set the default codes. Remember to set the Sales default account code because each time you add an empty line to your documents the Sales default account code will be used. If, for example, you are selling essentially services, choose the corresponding default account code. Use cost accounting allows you to enable the management of cost accounting. You can choose to manage your cost accounting by products (if you're trading) or invoices (if you sell services). 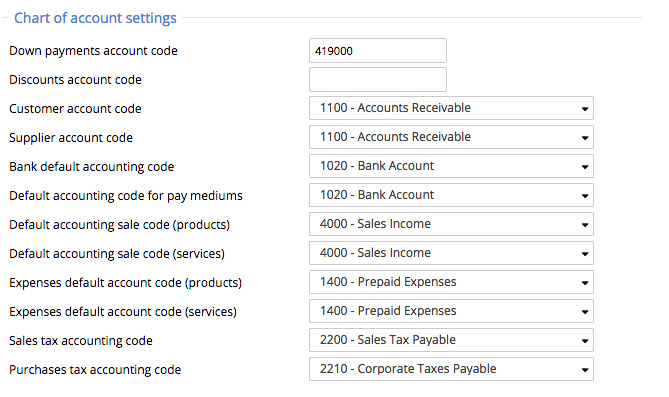 Cost accounting lines will be automatically added to your accounting exports without further manipulations. The export format allows you to define which columns you want to export and in what order. You can also choose to export or not the column header row. This allows you to get an imported file in the order needed by your accounting software.